Yes, the scene is taken directly from the Bondian cliché book, and that’s the way it should be. For those not familiar with the Star Trek universe, most ships and space stations are equipped with holo-suites – that being a large area where holographic movies are played. These holograms are 3D interactive movies in which the viewer can live and act out the stories contained within. These holograms also contain other virtual characters who will react and respond to the situations that they find themselves in. These holograms are so real, not just visually, but touch, feel, smell, hear, and taste, that they have safety protocols installed so that no one gets accidentally killed. 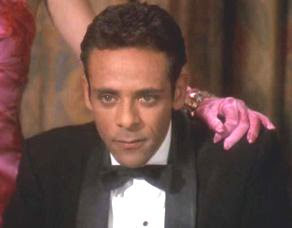 The opening sequence is Julian Bashir ensconced in a holo-suite, living out his very own private Bondian fantasy. As you know dear reader, that’s the kiss of death in a show like this. When a character says, ‘What could possibly go wrong,’ you know for sure that something is going to go wrong – horribly wrong. In the real world, a contingent of Deep Space Nine’s crew, comprising of Commander Sisko (Avery Brooks), Kira Nerys (Nana Visitor), Jadziah Dax (Terry Farrell), Lt. Worf (Michael Dorn) and Chief O’Brien (Colm Meany) are returning for a conference in their space runabout. As they approach DS9 there is a problem with their warp coil (engine, I think). Just as the ship is about to blow, Sisko radios for help and they are beamed aboard DS9. Well almost – they are beamed just as the ship explodes and the explosion causes a malfunction in the transporter. The crew are now just floating bits of information. The DS9 computer is trying to retain their body patterns and neural signatures, but is running low on memory for storing this significant amount of information. The computer searches for a suitable place to store this information until repairs can be made and the only viable solution is in the holo-suite. So the DS9 computer chooses to interrupt Bashir and Garak’s spy adventure. This results in the crew of the runabout now portraying the characters in Bashir’s spy simulation. But to make things even more complicated, even thiose these characters are computer generated, if Bashir or Garak should kill one of them in the course of the mission then the computer would wipe the character from it’s memory and in essence destroy the person playing it. Got that! Wait. There’s more. Adding one last layer of plot convolution, the ‘safety protocols’ in the holo-suite have been turned off, which means that Bashir and Garak can be killed by the artificial characters. Once the crazy set up is complete, the rest of the episode is a rollicking spy adventure where our two intrepid heroes, thrust together in a life and death situation must battle the megalomaniacal Dr. Noah and his evil henchmen. I cannot begin to tell you how much fun this episode is. Sure, the set up is the biggest load of piffle – but it’s not really important. It simply serves to place the crew of Deep Space Nine into the middle of an overblown Bondian spy adventure – and what’s wrong with that?